Resiliency + Disaggregated Space Architectures—Part One, Article courtesy of Air Force Space Command and is the combined work of several subject-matter experts. 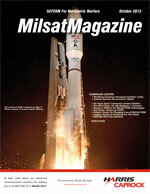 The U.S. Air Force’s Advanced Extremely High Frequency (AEHF) protected communications satellites have the most sophisticated communication payloads ever built in order to meet a top national priority mission: Provide assured communications to strategic nuclear and tactical forces that are protected against enemy jamming, spoofing, detection and interception. The timing can't have been better to embark on the HPA effort. As hurricane season’s peak approaches, and with Super Storm Sandy still fresh in everyone’s mind, it seems appropriate to examine Continuity of Operations or COOP. Command Center: Ed Spitler, Astrium Services Government, Inc.
Ed Spitler is the President of Astrium Services Government, Inc. and brings more than 30 years of experience in military, government and commercial satellite operations to his role as President. As has always been the case, dependable and secure communication is the most powerful weapon on today’s modern battlefield. Combat success depends on the quick and reliable transfer of information—video, audio and data communications have become essential tools for military personnel at every level. We’re in the middle of hurricane season—this year, meteorologists predict there is an above-average probability for major hurricanes making landfall in the Atlantic Basin, including the Caribbean Sea, the Gulf of Mexico and along the U.S. coastline. The future of space capabilities in the United States Air Force is at a strategic crossroad. A crossroad that requires us to address our means of protecting mission-critical constellations, to challenge traditional acquisition practices, to analyze new operational constructs, and to widen cooperative relationships both domestically and abroad. MILCOM, the premier international conference and exposition for military communications, returns to San Diego, California, and runs from November 18-20, 2013.